My husband and I both enjoy watching the birds in our backyard. Our kitchen table sits in front of our sliding patio doors and gives us a great view of everything in our backyard. I also enjoy photographing the birds and in this article I will give you some tips for photographing birds in your backyard. In order to photograph birds in your backyard you first want to attract the birds to the area where you want to photograph. 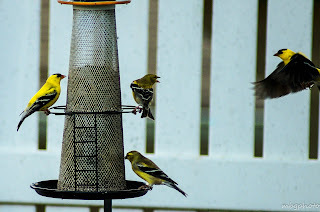 Last week Review This contributor Susan wrote a great article on attracting birds to your backyard in her article Backyard Garden Birds: Springtime Review . In order to attract birds you need to have things birds will enjoy like feeding stations, birdbaths and perches. When you are wanting to photograph birds, you need to go a step further and analyze where you have placed the places where birds will land. 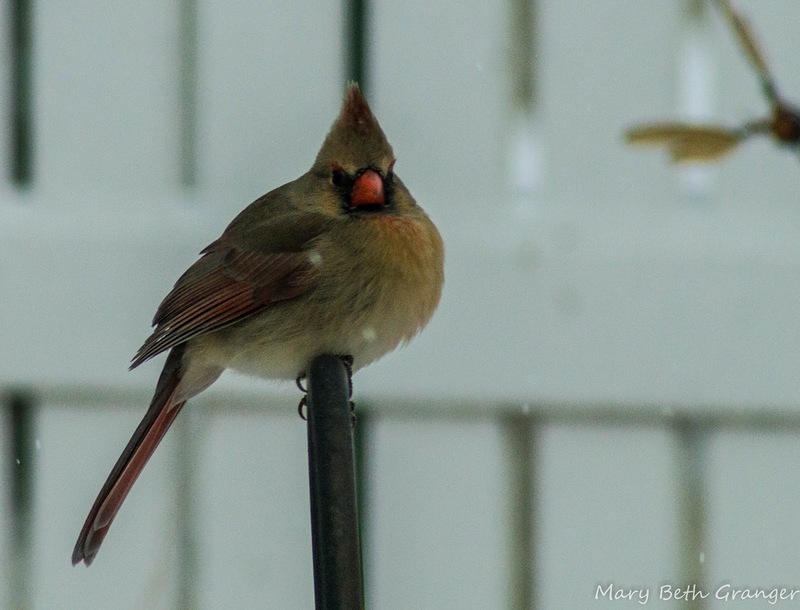 For example, you will want to look at what is behind the bird feeder that might also get into your photo. Do you have an unattractive trash can or some other distracting article in the background that you will want to make sure is not in your photograph? In my case I had my finch birdfeeder on a shepherds hook that I thought looked great, but when I looked through the viewfinder on my camera I realized the top of the hook went just over our back fence. What I captured when I zoomed in on a bird perched on top of the hook was an ugly pipe sticking out of my neighbors roof. With a little rearranging I was able to move the feeder a little closer in and now I have just the white fence as the background. 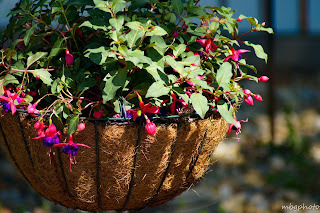 I have found that adding some colorful floral baskets around the area where the birds perch also makes for some attractive photos. I have a fuscia plant hanging near my hummingbird feeder and it helps to attract the hummingbirds. Hummingbirds are just starting to come to our area, so I'm anxiously awaiting to find a hummingbird on one of this beautiful flowers. We have a table near our sliding camera and I make sure I always have my camera sitting there and ready to shoot. One of the best times to photograph birds is in the early morning hours. They are most active the first few hours after sunrise, so in the evening I set up my tripod in front of our sliding doors so that I am ready to shoot in the morning. You can photograph birds with a hand held camera, but if you want to capture those birds in flight or get a great closeup a tripod and a remote shutter release are very helpful. I had both on when I captured the photo below. 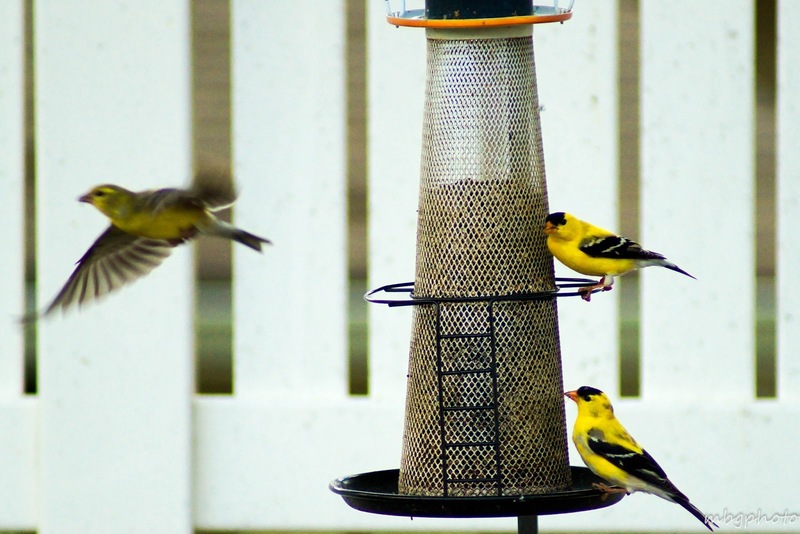 To capture birds in flight, set you camera on a tripod and focus the camera just off the feeder. 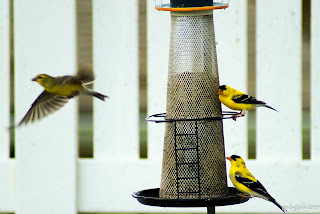 This way you will be able to photograph the birds as the fly to the feeder or when they are leaving the feeder. Now comes the second part, you sit quietly and wait for the birds to fly into your focus area. I often click the shutter several times before I get a bird all the way in the photo. 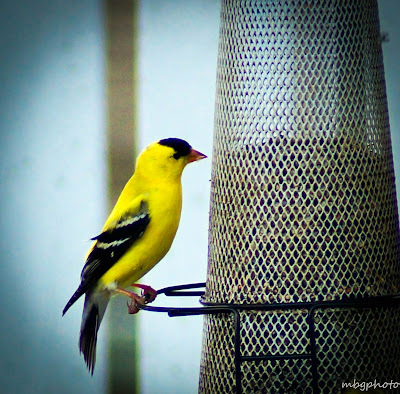 I have found the bright yellow Finch that come to our feeders to be especially interesting. Sometimes we have as many as eight on our feeder with several more perched on a nearby hanger or on the fence waiting their turn. I like the birds in this photo, note how the one on the feeder seems to be warning the approaching bird to stay away. Although you can photograph birds all year long, I find the springtime and winter to be two of the times when I am able to capture my best bird photos. In the spring the bright yellow finches are in abundance in our area and are very enjoyable to watch and photograph. In the winter, my favorite birds to photograph are the Cardinals. I love the way their colors stand out on a drab winters day and when it snows they puff up and look so majestic. I enjoyed making cards out of my bird photo's. 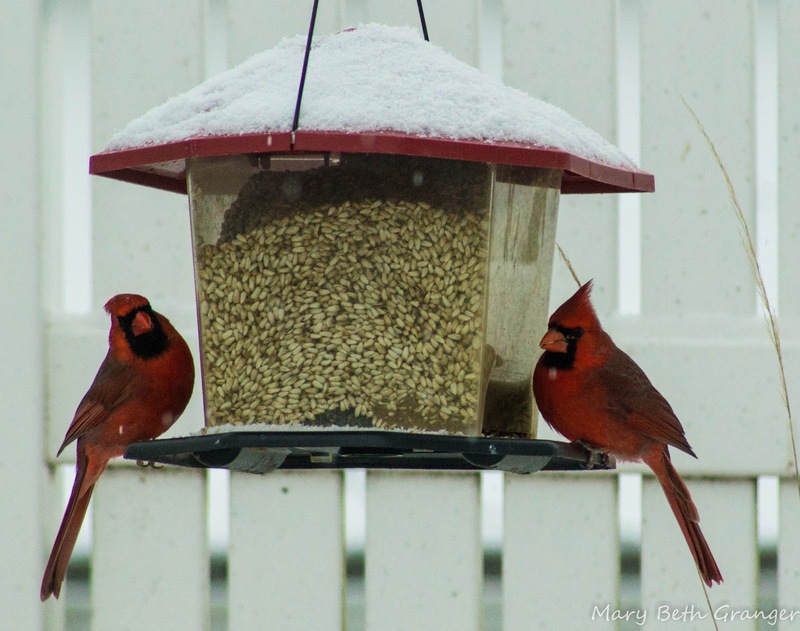 The one above is of a male and a female Cardinal sitting on an icy birdfeeder. 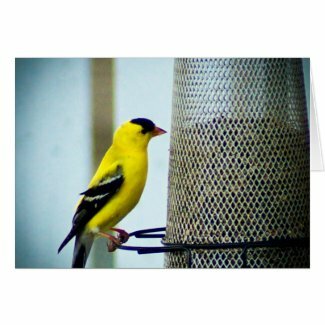 The card below depicts the American Goldfinch photos.